This pregnancy really has flown by. I’m already 32 weeks and I cannot believe I have just 8 more weeks to go! I feel like jumping for joy. Unfortunately my joints, with this pregnancy, are so painful. I can only flinch much less make it off the ground. With my first two pregnancies, my hips would disjoint while I would walk. My doctor said this was caused by rounded ligaments – basically my hips expanding to make room for the baby. The back pain came around the mid 8th month mark and around 9 months, when the baby dropped, then came the pubic pressure. No easy pregnancy for me. Luckily there are some great exercises that help loosen those maternity aches and pains. I can no longer do a split nor do I want to do a split while pregnant. I always stretch before each of my workouts and I found out that as my pregnancy grows, the longer I have to stretch. I lose flexibility and I experience tighter muscles with nerve pain. What used to be a 15 minute or 20 minute warm up pre-pregnancy, will be 30 minutes before the workout and 15- 20 minutes after a workout. Sit with your legs in a as wide of a split position as you can. Twist your upper body over to one leg and lean down as far as you can. Try to reach pass your toes. Feel the stretch in your back and in the hamstrings (the pull underneath your leg). Count to 10. Repeat to the other side. b. With your legs in a split position as wide as you can, reach forward and lean in front of you as low as you can to the ground. Feel the back stretch and inner thighs stretch. Count to 10 and reach further out. Count to 10 and reach further out again. Relax. With hands on your hips, walk around the neighborhood or backyard (or just around the house), lifting the knee higher than 90 degrees off the ground, alternating left and right. Walk for 2-3 minutes then relax. Repeat 2 more times. The walking motion combined with the knee lifts really helps my hip pain. It also gets my heart beating and that is good cardio. This has become one of my go to exercises to deal with hip pain, back pain and nerve pain. I stand on my feet a lot because I have two active kids. It is getting harder to stand up straight (and not arch the back). It is also getting harder to bend down to pick up after them or get down on my knees to clean up a mess/spill. By the end of the day (7PM), I am exhausted. Moreover, my hip pains are now accompanied by nerve pain that run up and down my legs and back. Any movement can cause like this electric static to my joints. Sitting down or laying down helps minimize the pain but if I try to get up then the pain returns. a. To squat, spread your feet about 3-4 feet apart as long as you still can maintain an equal distribution of weight in the center. Turn out your feet to help your hips turn out in the same direction. Dip, bending at the knees, making sure the knees do not bend over more than your toes. You will feel a stretch in your quads and buttocks. Rise and kick out your right leg. Squat again and then kick out your left leg. Do 12 squats alternating kicks per side (6 kicks each side). At the gym, there are usually benches placed randomly throughout that’s probably 2 feet off the ground. You might need someone to help spot you in case you lose your balance. Step up with Right foot. Lift up left knee. Lower left leg to the ground (So you’re now stepping down, never touching the bench). Lower your right leg to the ground. Muscle tension therapy is really promoted as a rehab recovery technique. It helps loosen muscle tension and stiffness by targeting knotted areas (those areas tend to be really tender and painful to the touch). Using the foam roller, you can self massage the top of the thigh, outer thigh and inner thigh by using your body weight to press down on to the foam roller to release the tight muscles. You need to continue to apply pressure especially to areas that hurt. I know it sounds sadistic to put yourself through the pain but afterwards your muscles feel so much different. There’s an increase in range of motion and strength. In other words, if I use a foam roller twice a week, that whole week is spent with less hip pain, back pain etc. If you do not have a foam roller handy, get a tennis ball. I like to lean my back against the wall with a tennis ball in between to massage out the lower back muscles down to the glutes and outer glutes. When I first tried this “massaging” technique, I was blindsided by the pain. It is comparable to giving birth. The pain is excruciating. Afterwards, there’s a lot of soreness that feels like bruising. Drink lots of water afterwards. Why then put myself through this painful exercise? Because it significantly reduces my nerve pain and my muscle stiffness. Furthermore, I feel like my legs actually have strength in them, instead of feeling brittle and writhing with pain. Try these techniques. I do recommend consulting with a physician before starting any new workout/regimen. If you are unsure of any of these technique, please stop doing them. I found these exercises different but very helpful in my personal case. But everyone is different and you should do only the exercises you are comfortable with. If you have any questions, please leave a comment! Thanks. 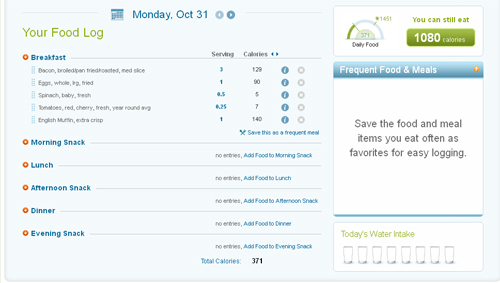 A friend told me about this online planner from WebMD that gives you the ability to track what you eat and how much your exercise. I have heard of online planners that charge to do this, but WebMD is totally FREE. Yes, FREE. Plus you can sign up to get daily emails regarding what foods you need to eat and daily log reminders so you won’t forget to track your meals and exercise. WebMD’s tool also lets you see the amount of calories you’re consuming and how much you are burning from what type of exercise. I do wish they had an app for my phone that I can log in my habits while on the run. Otherwise, this is a useful tool for anyone looking to lose weight and need a visual motivator. Fitsugar.com reports what Jennifer Aniston does to keep in shape. This video features her yoga guide Mandy Ingber teaching different poses and positions in order to maximize the right muscles to get the right definition. The video seems easy enough that it makes me motivated to try this at home.